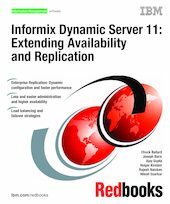 In this IBM® Redbooks® publication, we provide an overview of the high availability and enterprise replication features of the Informix® Dynamic Server (IDS) Version 11, which can simplify and automate enterprise database deployment. Version 11 has patent-pending technology that virtually eliminates downtime and automates many of the tasks associated with deploying mission-critical enterprise systems. The high availability capability can reduce or eliminate costly downtime, for example, through online index rebuild and point-in-time table level restore. Enhanced enterprise replication enables solutions for customers requiring reliable and fast distribution of data across a global organization. The replicated data can also participate in a high availability environment with capabilities such as seamless online resynchronization of enterprise replication (ER) nodes at startup. IDS now also has two new replication technologies for you, called Remote Standalone Secondary (RSS) and the Shared Disk Secondary (SDS), as well as enhanced capability for high-availability disaster recovery customers. The new GUI-based OpenAdmin Tool for IDS provides a global view of remote servers, with flexible analysis and drill-down to the query level. These capabilities enable faster, easier, and reliable distribution and high availability of data, enabling improved data access and use throughout the enterprise. For improved availability and data replication, you need IDS 11.